If you have worked in communication or marketing you are probably familiar with thinking about the media landscape in terms of owned, paid and earned media. It’s a good way of structuring the different types of media, but it should not control how we work with messaging, target groups and content. In a time where the customer is in control, and the borders between media types are blurring, we need to have a strategic perspective and work to achive a convergence in media use. To start from the beginning; Paid media is everything we buy, from magazine ads and billboards to direct marketing, on-line banners etc. We don’t own the channel, instead we pay to make use of it. Earned media is when we gain access to editorial space in media with the aid of PR. We don’t pay for that attention with money, but rather use stories and ideas that are interesting enough for a journalist to want to pursue (or because they need to fill space if we’re honest about it). And owned media, finally, is the channels we have total control over, or at least control of the content. It can be digital channels, print, events and social media. In many ways this is merely a description of functions, a way of defining the differences between various points of contact and how we gain access to them. But in reality this way of looking at media has to a large degree defined how we have approached communication and marketing. We have permitted it to define everything from strategy to tactics. One specific example is marketing plans, which very often are based around campaigns. The reason for this is that they almost entirely have dealt with paid media, where companies can’t afford to have a continous presence for every brand or product. Traditionally we have given most of our attention and budget to paid media, as in advertising. But the digital evolution has made it possible for us to consume and collect information from a variety of sources, and from different media. Today our prospective customers can research whatever they want themselves, they ignore TV commercials and have stopped reading newspapers. They share news via social media, click on whatever link they find interesting and pay no attention to if it originates in paid, earned or owned media. It’s obvious that campaign based marketing, visible for a limited time, can’t do the job in a time where a buyer’s journey can begin at any time, and increasingly from any place. In Sweden the decision making process of where to spend the next vacation used to be triggered by the arrival of catalogs from the travel agents, and then discussed around the dinner table. Does that still happen? Very unlikely. The journey to a decision might start early in the morning, surfing on a smartphone, or late at night in front of the TV on an Ipad. It might start with a search or a link someone has shared on social media. And the discussion might not even take place around the dinner table, but rather in cyberspace. How do we get in to this buyer’s journey using only paid, campaign based media? One consequence of this is that interest in paid and even earned media has dropped off, in favor of owned media. The whole concept of content marketing is largely based around the use of owned media, adding search and social to the equation. And in a sense that is good. Relevant, useful content available in our own channels is the only solution we can offer that is available 24/7 all year around. There is always a risk, however, that we allow one concept to surpress all others. Like I pointed out paid media dominated in the past. Now owned media is positioned to do the same. But we can’t allow that kind of silver bullet thinking to take over. In order to be effective at marketing and communication, in order to reach our target audiences, we need to work with a combination of paid, earned and owned media. And to be able to do that we need to do it in an efficient way. A study by Altimeter Group from 2012 The converged media imperative argues very convincingly why and how we should do this. First and foremost, they capture how our target audiences view things “Consumers rarely pause to note provenance. Media are a veritable blur. The primary quest is for information, entertainment, or shopping. The goal is simply to find the “right” media, be it paid, owned or earned, along this highly dynamic customer journey. Brands are challenged to intercept this elusive customer and cut through the media clutter, regardless of whatever channel or medium consumers are engaged with.” In the heated debate around native advertising I don’t think this perspective has been given enough attention. The truth is that the difference between various types of media is of more interest to us that work with it than to those we are trying to reach. We have allowed it to dictate how we organize ourselves, how and what we plan and how we spend our budgets. But it isn’t important to the people we want to engage with our content and messages, and then we should not let it control our communication or marketing – even those terms are a construct to a degree. In the final analysis we need to have a connected, coherent strategy for how to reach and engage with our target audiences that covers all three kinds of media. 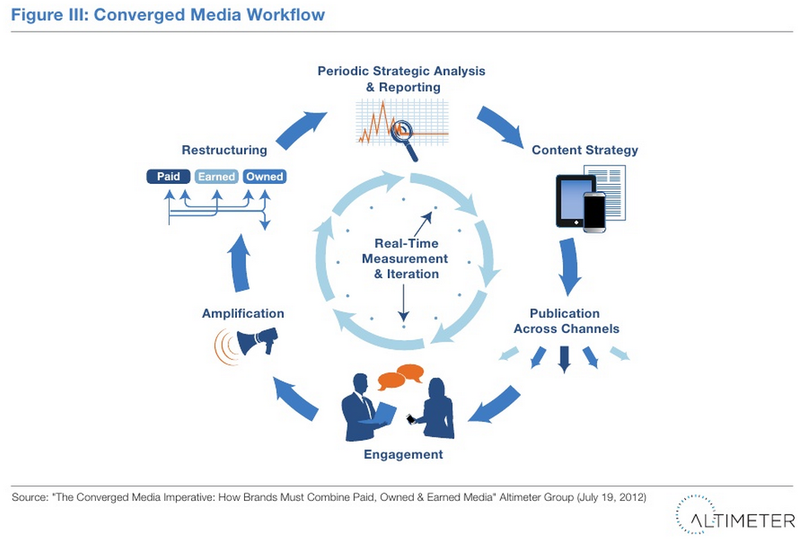 Altimeter calls this a “converged media workflow” (see image above). Powerful stories or useful content will have a much greater impact if it can be used in owned, paid and earned channels. Traditional mass market channels like television, radio and magazines still have a strong position, and the attention we get through earned media is very important because its percieved as trustworthy. Owned media has the advantage, apart from the fact that we control it, of being always available, at least the digital channels, and that makes them the preeminent place to develop and deepen the relationship throught different types of content and interaction in social media. The obvious starting point for a coherent strategy is to look at the brand, the target audiences and the goals. The next step is to shape the stories and the useful and relvant content. Then we can use the unique strenghts of owned, paid and earned media to distribute our content and messaging. A converged media strategy will ensure that we get the best out of each one of them. 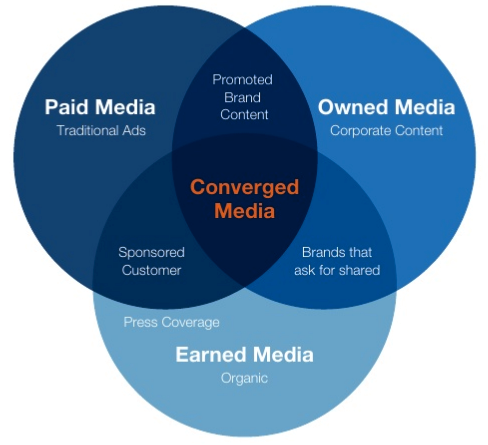 Images in this post are from the Altimeter Group report The converged media imperative. I was browsing the net amd accidently come across your page and read some of your articles. I found these very helpful. Sorry for being so straightforward. Your e-mail will not be visible.